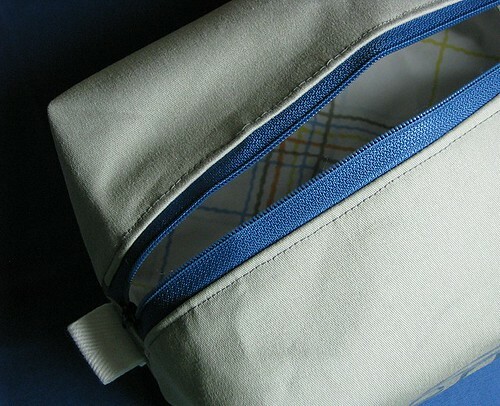 The hubby needed a travel bag for his various toiletries for when he goes out of town. I wanted it to be sorta manly, for the rugged and tough kind of guy that he is. So I stood in front of my my fabric stash and not a single piece would work for this. Apparently I don’t collect masculine looking fabric, except for a few solid pieces in gray, blue and black. But, a solid seemed to plain and boring. THEN, I got the idea for making my own masculine fabric. I pulled out my Lotta Prints and from there knew exactly where I would go with this. 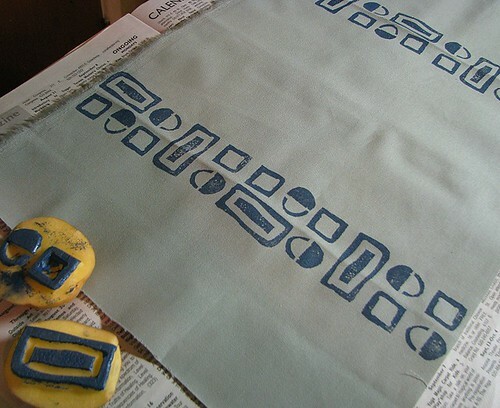 Potato printing isn’t just for kids anymore. Oh no, it’s way more fun as an adult and it worked out fabulously. I made a very simple design onto the potato using my linoleum cutters. Then I used Tulip Soft Fabric Paint, mixing my own navy blue color, used a sponge to appy the paint to the potato and did a few practice tries on paper. I am really surprised with the results and the hubby loves his new travel pouch. This entry was posted in Sewing, Stamps. Bookmark the permalink. It looks fantastic! Great shape! it’s so awesome. I want to try this!!! wow! I love the look! great idea! what are linoleum cutters? are they dangerous? The bag turned out great! I love the colors. Lovely! Is that a vintage sheet piece for the lining??? whoo hoo ! you are famous on Craft! congratulations! Nice job too on the bag. That’s lovely (is that the right word for a manly bag? lol ). Great choice of colours and shapes. this bag turned out awesome! 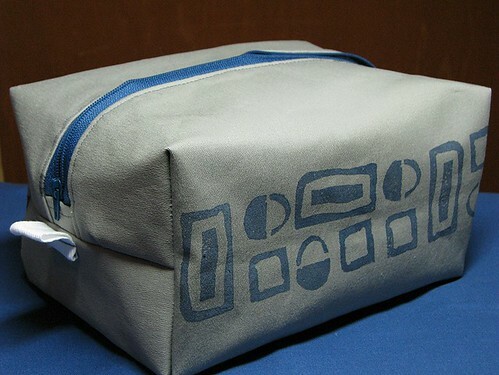 do you know where I can find a pattern for this type of bag? anyone? This bag turned out gorgeous…or….should I say handsome, since it is for a boy:) LOVE IT! This looks marvellous! i like your print designs. I’ve been making wrapping paper with similar prints, although I use a sweet potato/yam because it’s less wet. Lotta Prints is a great book! Love it! Great job on the potato printing.